Peter Molyneux has revealed his latest project. The Trail: Frontier Challenge is a version of the mobile game his studio, 22cans, released last year, but “rebuilt and redesigned” for Steam. Play your way in the best sandbox games on PC. Presumably, this is ‘Legacy’, the project Molyneux mentioned back in April but was uncharacteristically reticent to discuss. 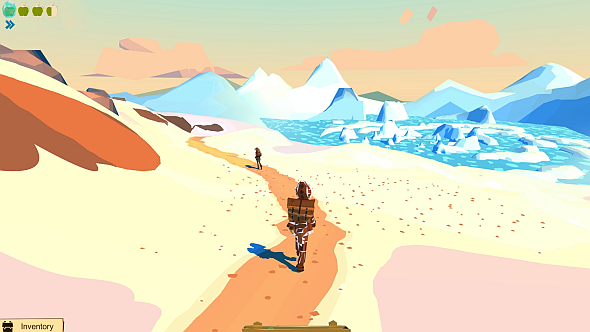 The mobile version of The Trail is a game about exploration and discovery; players hike across unknown countryside toward the town of Eden Falls, gathering and crafting as they go, before ultimately settling in the town and making their fortune by trading with other players and/or working in a profession. So what’s new in the PC version? The Steam page is live now, promising a release some time this summer. The game will feature five professions (lumberjack, hunter, cook, tailor, and explorer) in which you can level up and work to make your fortune. You’ll join other players to develop your own community, build and furnish a house, and even get a pet dog for company. Though the mobile versions of the game are highly-rated, the response to the new trailer has been less positive: it has more dislikes than likes, and the comments section makes frequent reference to Molyneux’s reputation for over-promising and under-delivering.